Our love for Harry Potter runs deep in our house. From the ultimate Harry Potter birthday party, to making our own Hogwarts letters, to building a Quidditch Pitch in our backyard, we have truly incorporated Harry Potter into most things, except Valentine’s Day. This year I was determined to create some fun and easy Harry Potter Valentine’s and I am thrilled with how they turned out. 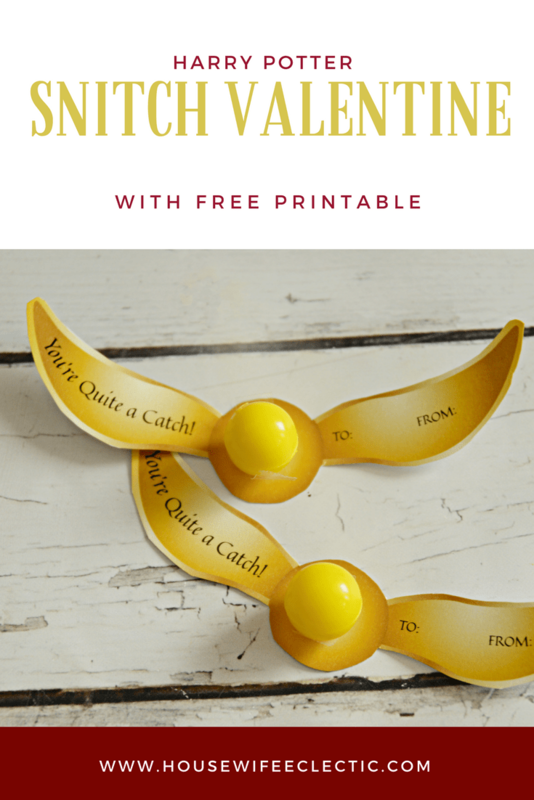 This Snitch Valentine is incredibly easy to make and with six to a sheet, it won’t even take that much paper! 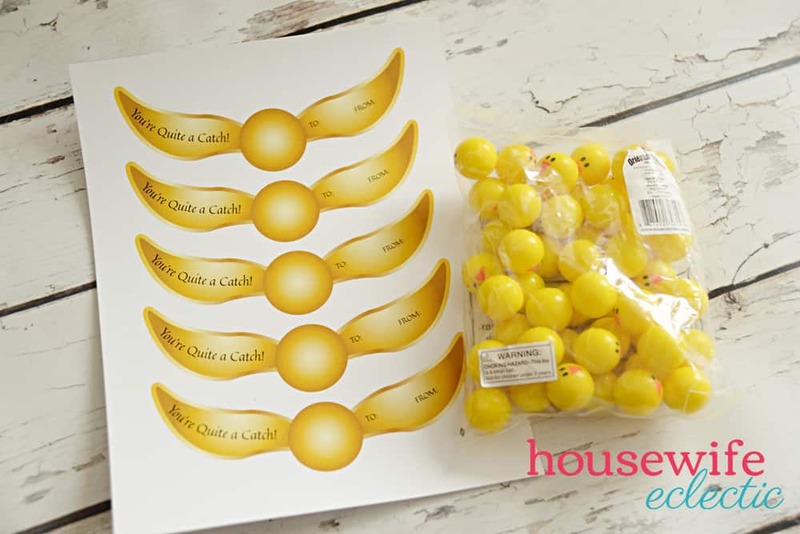 The best part was being able to find this huge bag of yellow bouncy balls from Oriental Trading, they are darling chick ones so I can use the leftovers for Easter eggs! Oriental Trading provided the bouncy balls for this post but the design and idea were mine. No other compensation was provided. First, print the printable on card stock. This will be extra durable which will help when your child hands out the valentines. Cut each valentine out and then address the to and from on the wing. 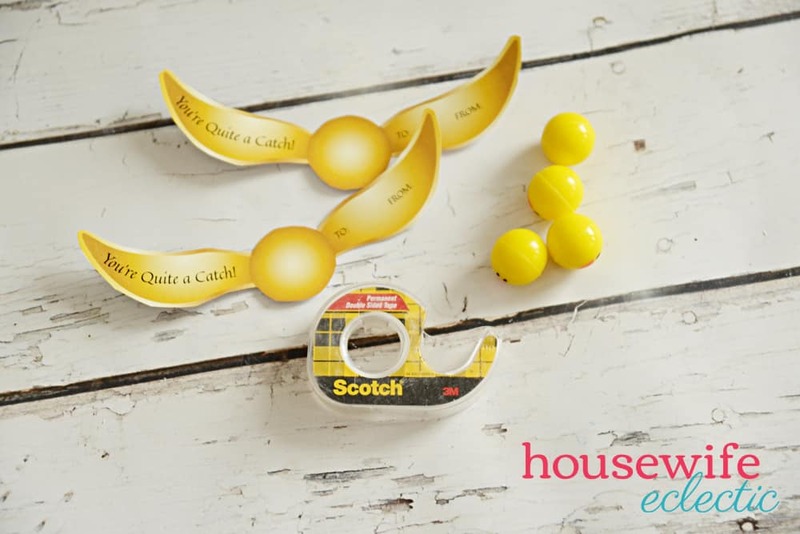 Wrap the bottom of the bouncy ball in double sided tape (for this project, you want to cover the chick face with tape.) 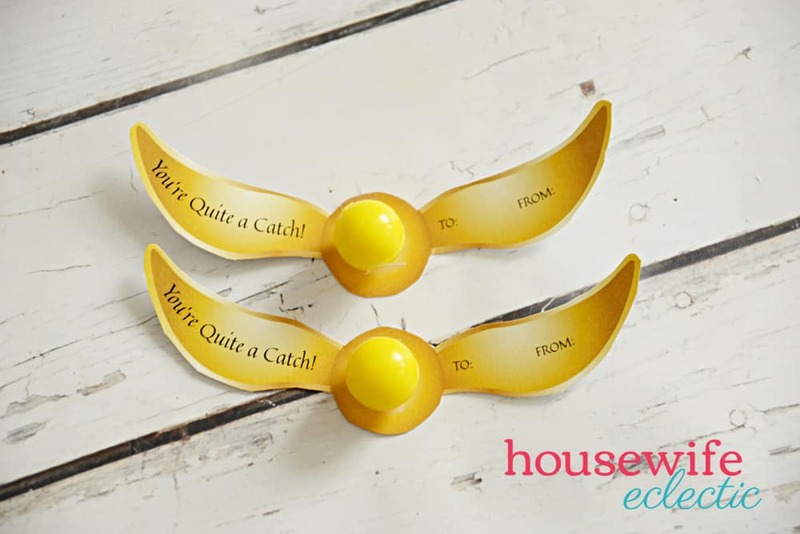 Stick the bouncy ball to the center of the Snitch and you are done! Easy Peasy. Who in your life would love to receive a Harry Potter Valentine? This is such a cute idea! Perfect for Harry Potter fans. I’m just doing small gift bags with candy and slime in them. I LOVE Harry Potter! This is a terrific Valentine’s idea. I like how creative and unique this is, and how easy it is to put together. Well isn’t that adorable! And it will be fun to make for kids that are very much into Harry Potter. I love how easy it is to do. We all love Harry Potter! These are totally cute. If my daughter went to public school, she’d love to pass these out. I love these. I also love that you got the yellow balls from Oriental Trading. I know they are reliable for getting things I need for my crafting projects. OK I need to make my other half one of these, I am huge Harry Potter fan and I think he would find it lovely. Where was this when I was growing up. These would’ve been the perfect valentines to pass out to my classmates. So stinking adorable and creative. My eight year old would love these. He’s into all things Harry Potter! I love how simple it is to make! This is so creative! Perfect for Harry Potter fans. My kids really like unique Valentine’s Day gift ideas so no store bought cards here. Truth is, just a couple of touches like you said using a few things you may already have and voila something that wows. 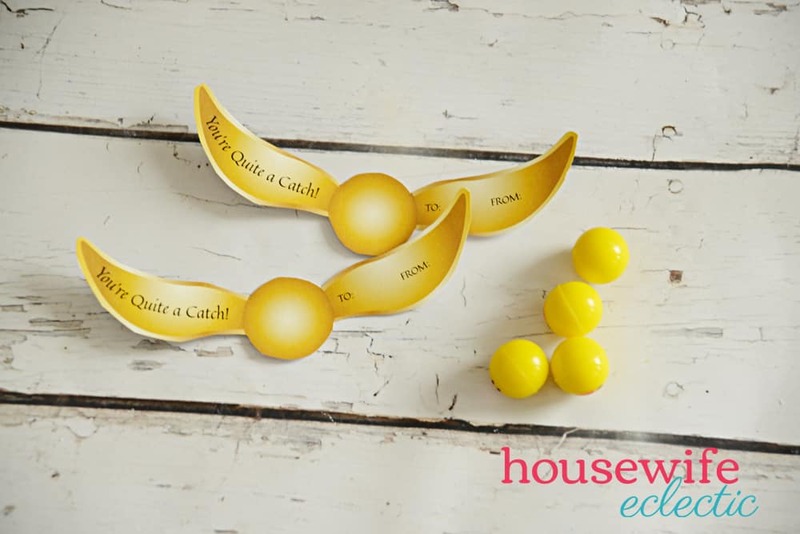 Harry Potter fans are going to love these! They are adorable. This is such a cute idea for a fun Valentine. Pretty much everyone loves Harry Potter so this would be a hit at school. These are such a unique idea for Valentine’s Day. A lot of kids love Harry Potter so I am sure this would be a popular treat. These are SUPER cute! My oldest loves Harry Potter and would love to make these for her friends. I have a friend who’s a big fan of Starwars. Cute gift for Valentines day i like how it is printable. I see a lot of Vday gift ideas nowadays and this is one of my favorite. Now that is a really cool idea. They are really easy to make too! This will go over super well with the kids. They love the Harry Potter stuff. This looks like a great idea for Valentine. It is unique and does not involve candy! I would love to make this for my friends who are Harry Potter fans too.